Think of an image of a working mom in the office. What words come to mind? Frazzled? Distracted? Less devoted? One of my pet peeves about the average workplace mindset is the perception that women somehow automatically “give up” focus, skills, dedication and the ability to succeed simply by having children. It seems like the world forgets that we — as women and parents — are just as brilliant as we were before having a baby. And our skills most certainly haven’t gone out the window. All the attention seems to be on what is lost instead of on what is gained by becoming a mother. We talk ourselves into thinking we’ve somehow become less an employee because we took leave, take time out of our day to pump or have a hard stop at the end of each day to go pick up the children. Today, I urge you to focus on — and to talk openly about — all the new and amazing muscles you are growing by being a mother. If you’re new on this journey, some of these skills may reveal themselves to you over time. Here are a few amazing workplace and leadership skills I have personally grown and developed as a mama. As a parent, it seems like absolutely nothing happens according to plan. Or it will for a while, and then abruptly, the plan changes. Parents can’t plan their baby’s every move, mood or hunger cry. They may not be able to get out the door at the exact moment they wanted. And these challenges teach them how to deal with curveballs at work too. I am infinitely less frazzled about work stresses than I was pre-kiddos. Rarely does the same solution to a baby-related problem work two times in a row. Parenting has expanded my vision for what’s possible at work too. Great leaders use their voices. And my own public-speaking skills skyrocketed with working parenthood. In the sleep-deprived state that was my life with a baby and a toddler, I had less energy and simply no time for the “drama” of anxiety around giving a talk. I no longer had hours to sit and stew about how a given presentation was going to go or not go. So I simply got up and used my voice rather than worrying about what might happen if I did. I recently had a friend without kids tell me, “Well, everything on your to-do list has to get done at some point, right?” Nope. There are the must-do’s, the nice-to-do’s and the time-wasters. Having kids has helped me get straight really quickly on which category each task falls into so I can prioritize. Little babies (and all children!) certainly are demanding customers, aren’t they? And the better you’re able to predict in advance what they need, the smoother your day goes. The same is true for your boss’s needs or your client’s needs. As a working mom, you can’t get out the door in the morning (or get out and actually stay out) without a massive amount of advance planning. Organization is a survival skill for me, both at home and at work. Asking for help on the mama front is absolutely critical. And as you return to work after having a child and grow your career as a working parent, it becomes a workplace survival and success skill too. I’ve had to let go of control over tasks, both on the household front and the work front, and delegating to others has helped their careers grow. Disasters at work just don’t seem as bad as they may have been in the past. Parenthood has revolutionized my perspective on what really matters in life. For the better. If you’re ever feeling down about working-mother stigmas or your own motherhood fog, I encourage you to take some time to make a list of your working-mama skills. Remind yourself of them regularly (this watercolor is a gorgeous way to keep this front and center! ), and tout them in your workplace. 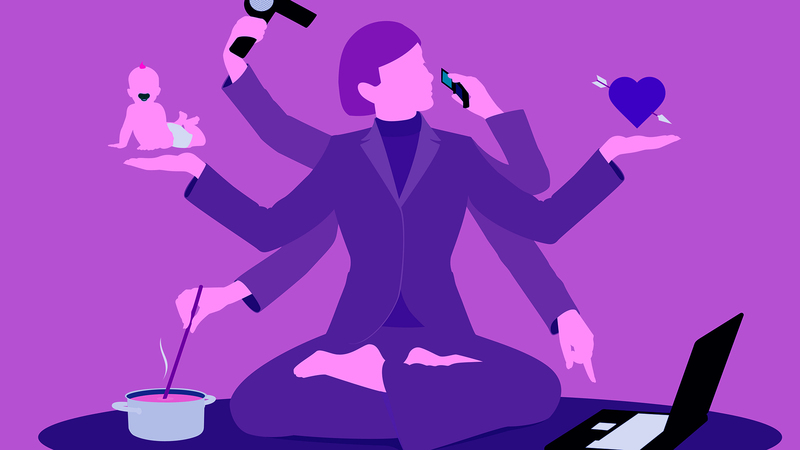 By putting our focus on the areas where we have become amazing mama ninjas, maybe — just maybe — we can change the conversation about the value of being a working mama both in our own heads and in our workplaces.